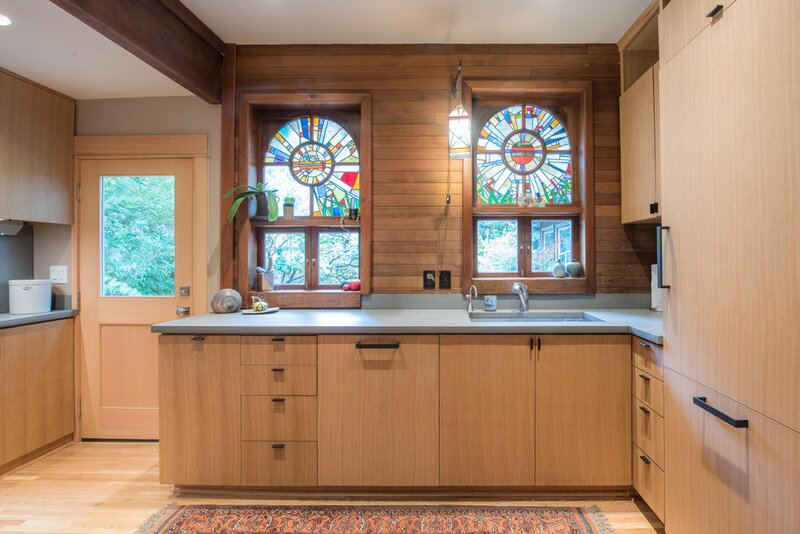 First renovated by the client's parents in the 1970s to include stained glass windows and an open floor plan, our goal for this kitchen remodel was to preserve the best parts of their artistry while updating the room to feel fresh and cohesive with the rest of the home. In addition to the windows, we opted to preserve beams, window trim and wood walls from the '70s remodel. 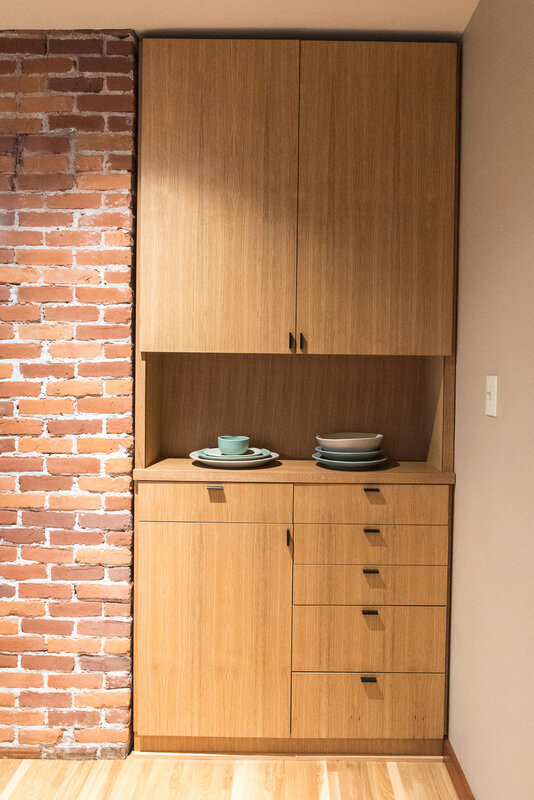 As an added bonus for the project, we got to work directly with a talented furniture designer (a friend of the client) who carefully crafted all of the cabinetry from our designs. New flooring, finishes, fixtures and an exterior door were designed to seamlessly blend modern design, artistic influence and a zen-like feeling throughout all interconnected spaces. New oak flooring was installed in the kitchen and dining rooms to match the original floors in the living room. In an open floor plan, minimizing flooring changes helps to maintain flow through rooms. Space for the refrigerator was limited within the kitchen layout. We wanted the custom cabinetry to be what attracted the eye, not the appliances. By selecting a cabinet-faced counter depth unit, it becomes seamlessly integrated into the rest of the rift sawn white oak cabinets. Working with the existing appliance and exterior door placement proved a fun challenge. Utilizing every inch of space, we captured a narrow area to the left of the stove for cutting boards and baking pans. The range hood is hidden into upper cabinetry. Installing a narrower base cabinet behind the door allows it to swing fully open to access the lush backyard. The gorgeously crafted rift sawn white oak cabinets stand out against the subtle tones and texture of concrete counters and backsplash.